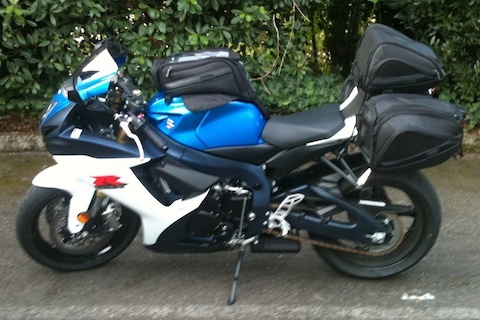 I purchased a set of MotoCentric soft luggage for my 2012 GSX-R750 in August of 2012. I paid $62.99 for the tail bag, $69.29 for the magnetic tank bag, and $119.99 for the side bags from Motorcycle-Superstore.com (I had a 10% discount coupon). I’ve since put a few thousand miles on the bike, mostly commuting to work and local day rides, but recently I used them for an overnight trip (250 miles each way) to John Day, Oregon. The MotoCentric Mototrek soft luggage system represents a solid value in soft luggage for sport bikes. The tank bag is used on my Gixxer all the time. Since my AGVSport leathers only have a single interior pocket, I put my garage door opener and cell phone in the tank bag. I also put spare gloves, a rag, and a few other miscellaneous items in it. The magnets are very secure and it’s nearly impossible to lift the bag straight up. You have to peal it back from front to back to remove it from the bike — that approach works easily. The side bags take a half hour to install and adjust to the bike, but once that’s done, they go on and off in a matter of minutes. The tail bag takes even less time to adjust, install and uninstall. Once mounted, both the side bags and tail bag are rock solid, even at high speed. I’ve not loaded the bags to capacity yet. The tail bag and side bags have zipped expansion panels that make them wider and add to their capacity. On my recent overnight trip, I was able to carry a fair bit of clothes, toiletries, an iPad, and a few other items without needing to open up the expansion panels. The additional weight in the side bags didn’t seem to affect how they hang on the bike at all. I was impressed. The individual features and details of the MotoCentric bags show attention to detail. Although they are relatively inexpensive, they aren’t cheap in terms of features or quality. The zippers work well, fit and finish exceeds my expectations, and the materials used are high quality. This past weekend I rode up through the Cascades to the small town of Detroit, Oregon. It was raining the first quarter of the journey so I pulled over and put the waterproof covers over the tank bag, tail bag, and side bags. The cover for the tank bag resides in a small pouch on the forward tip of the bag. The cover is permanently attached at one point on the front, then wraps around the part of the bag closest to the rider’s chest using elastic. There are no tie-downs or snaps, just elastic. While riding, the cover remained secure. The covers for the side bags are similar to a shower cap, with an elastic band around the opening. They also feature a springy drawstring that can be cinched tight. The covers flap around in the wind when riding, but that cinch strap keeps them on the sidebags. Unfortunately, the cover for the tail bag wasn’t as secure. It uses only elastic, no cinch cord, and when riding back toward home it came off and now has to be replaced. It’s possible I didn’t have it pulled down all the way around the tail bag, but I’m usually pretty meticulous about checking those kind of things. A cinch cord on the tail bag cover, like the one used on the side bag covers, wouldn’t cost the manufacturer much and would provide a more secure fit. Other than losing the tail bag waterproof cover, I have no complaints about the MotoCentric soft bag products. I view them as a good value, worth more in features and quality than their cost. Call me loyal, but every helmet I’ve worn has been made by HJC. I’m not saying they’re the highest quality brand available, but I am saying they are probably the best value helmet brand you can buy. My first helmet was an HJC SyMax, purchased at a local motorcycle dealership a day before my MSF Basic Rider’s Course back in September, 2006. It was affordable, comfortable, and had a basic set of features that suited my riding needs. After a few years, I upgraded to the HJC SyMax II, the updated model of the SyMax. It had increased features and was even more comfortable. That helmet has been with me for over 30,000 miles and has served me well. Many people feel that once a helmet has been worn for three years, it’s time to replace them. This is because the padding inside compresses and apparently moisture and exposure to the elements weakens the helmet’s ability to protect your noggin in an involuntary get-off. The logical replacement choice was the SyMax III. But there was another option available, and after reading a lot of reviews and analyzing the available features, I decided to get the HJC RPHA-Max. It is a higher-end modular helmet, costing almost $150 more than the SyMax III, but it had a feature set and level of quality that I was looking for. I ride 10,000 miles a year, in all kinds of conditions, and I wanted a helmet that could meet my needs. The RPHA-Max has a slightly more neutral shape and is sized a bit smaller than the SyMax series, so I ordered a medium instead of a small. That was a good call — it fits my head well with no hot spots. The fit is a little different, however. The bottom of the helmet seems to be closer to my shoulders and this makes it slightly more difficult to swivel my head around. I still have a full turning radius, but it takes a bit more effort at the extremes. The chin bar also sits slightly closer to my mouth. What’s weird about this helmet is that it has the same smell inside as a new car. The chin skirt is a mixed blessing. It blocks noise and airflow, which is good on cold rides, but it blocks airflow, which is bad on warm rides. Once I seat the chin bar down into its locked position, I sometimes need to reach up with my finger tip and pull the chin skirt down off my chin into it’s intended underneath position. When riding a bike with a windscreen, the helmet is quiet and stable. On my V-Strom 650, I now have the quietest ride of any helmet I’ve worn. When riding my 2012 Suzuki GSX-R750, however, things change. I noticed my head position drastically changes the noise level in the helmet. If I’m facing directly forward, it’s quiet. If my head is titled down at all — like I’m trying to touch my chin to my chest — it gets very noisy around the face shield. If you ride an unfaired bike that has a neutral seating position, no worries. The RPHA-MAX is quiet and rock stable. If you tilt your head down at all, the aerodynamics change at a very specific angle and it gets noisy. 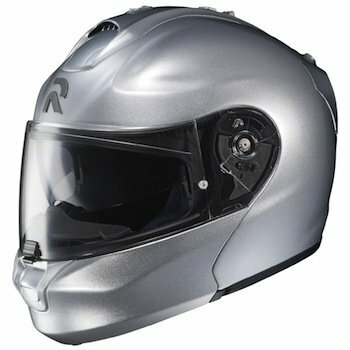 Considering this, I wouldn’t recommend this helmet for those riding race-replica sport bikes (most folks that ride these type of bikes don’t wear modular helmets to begin with, so this issue may be moot). The visor has excellent horizontal peripheral visibility, but slightly reduces the bottom portion of the vertical peripheral field of view. This means when I’m riding, I now have to tip my head down slightly to get a full view of my V-Strom’s speedometer. I never had to do that with my SyMax or SyMax II. The upper quadrant of my vertical field of view is about the same; no restriction of view. The visor has outstanding clarity, but when I bring the built-in sun shade down, some distortion occurs. The main visor now has a central grab point (and lock!) instead of offset to the left. This means I can raise my visor with either hand. I was able to grab the visor lift point okay while wearing my Cortech Scarab winter gloves. Although I suspect the visor has several detents, in actual use it seems I can place the visor in any position I want and it will stay there. Top ventilation on the RPHA-Max is outstanding. A simple flick of the switch on the top of the helmet brings immediate and noticeable airflow across the top of my head. I can notice it even when wearing a bandana or other head covering inside the helmet (which I usually do to absorb sweat). This will be a very handy feature during summer rides. The helmet is lightweight, making my previous helmet, the SyMax II, feel heavy by comparison. It feels more snug around my cheeks and neck, and despite having a slightly different internal shape, it still fits my head comfortably. I’d say the RPHA-MAX has a neutral shape. The noise level is pleasant (I wear earplugs). Overall, the helmet feels like more of a precision instrument than its predecessors. The visor is relatively easy to remove and put back on. Since it’s a Pinlock type and I have the anti-fog Pinlock insert, I don’t need to take it off to apply shaving cream — the poor-man’s anti-fog solution. This is my first use of a Pinlock visor and I absolutely love it. I’ve since ordered a Pinlock visor for my HJC CS-R2 helmet, worn when riding my 2012 Suzuki GSX-R750. One of my complaints of the SyMax series was the visor didn’t form a tight seal against the brow of the helmet, and this allowed rain to run down the inside of the visor. The RPHA-Max appears to form a tight seal all the way around, and so far it has kept the rain out. I’ve worn this helmet for over 5,000 miles in all sorts of weather conditions and I would say it has continued to exceed my expectations. It is versatile and comfortable and has held up without any issues. It has done a good job of keeping water out when riding in the rain, and the Pinlock insert has been wonderful at preventing fogging on the inside of the visor. As I have stated before, this helmet is an excellent value and if I needed to get a new helmet, I’d buy another HJC RPHA-MAX without hesitation to replace it. Removing the chin skirt is an easy process (just follow the simple directions). Doing so is good when you’re riding in warm weather but perhaps not so good when riding in cold weather. On my commute in this morning, it was 34 degrees. Minus the chin skirt, a fair amount of cold air circulated across my face and made my eyes water for several minutes until they got used to it. I placed my glove under my chin to replicate the chin skirt I had removed the night before and the airflow stopped immediately. I also added the included anti-fog Pinlock insert. It was easy to put into place (as you might imagine), didn’t reduce clarity at all, and eliminated fogging entirely during my cold morning commute. Yay! No more rubbing shaving cream on the inside of my face shield! Technically flawed but creatively interesting? I am perplexed. I’ve been reading works by several other recently successful new authors and I’m noticing a trend. Their stories are technically flawed yet they are demonstrating surprising levels of interest and enthusiasm from their readers. All the books and articles I read about what constitutes good writing are fairly clear and consistent in their message. Show the reader, don’t tell them; avoid excessive hyperbole; etc. The stories I’m reading fly in the face of those Good Writing Maxims. I won’t name names because I’m truly happy that these authors have landed publishing deals. I’m even happier for them that their books are doing well. Ultimately that’s what makes a good book: people enjoy it and show that support with their pocketbooks. In my own effort to write and refine Ohlen’s Arrow — and ultimately my goal to get it published — I have spent a great deal of effort and time following the rules of what constitutes good writing. After reading other works, I’ve also gone back and made sure my characters were interesting. Something can be technically flawless but if it’s not interesting, who cares? Consider a musical analogy: Credence Clearwater Revival. They were, and still are, a hugely popular band yet their musical chops are rudimentary at best. As a reader, can you overlook technically flawed writing if the characters and situations are unusual and interesting? Or can that get in the way, preventing it from being what would otherwise be a good book? When writing a fantasy novel, coming up with a great story is only part of the equation. You could say that’s the roast beef of the meal, but there’s a lot of mashed potatoes and green beans that still need to go with it. If you want to know how to cook the whole meal, The Guide to Writing Fantasy and Science Fiction, by Philip Athans and R. A. Salvatore, is a great cookbook to read. I purchased the $9.99 electronic edition from the iTunes Bookstore and read it on my iPad. The chapters follow a linear path through the process of writing a fantasy or science fiction novel, from how to come up with ideas to getting it published. The book specifically covers the business and marketing aspect of getting your book published, which is the primary reason I bought it. Athans and Salvatore don’t pull punches when it comes to letting the reader know their chances of making money as an author. That honesty is exactly what aspiring authors need. There are a lot of books that can help you improve the mechanics of your writing. Writing Worth Reading by Nancy Huddleston Packer (which I’ll review later) is an outstanding example. There are even some books available that focus on getting published. This book, however, is a concise source of both. Consider it a crash course on the gamut of writing and publishing your first fantasy or science fiction novel. This book is worth far more than the purchase price, making it an outstanding value to beginning novelists like me.